Building a wall won’t stop mass murders in America, as the worst offenders, historically and at present, are white so-called “Christian” men. A hard hearted South would not be moved; over the next few years, southern legislatures began spending sprees to “improve” segregated black primary and secondary schools and public Black Colleges and Universities in hopes of enticing Blacks to stop the push for integration. Far more wickedly, southern legislators, local governments, the Ku Klux Klan and White Citizens Councils doubled down on Jim Crow through vigilante violence in the form of rapes, beatings and lynching, and by incorporating the Confederate Battle Flag into state flags. Or, southern political figures began flying the Stars and Bars outright at football games, at statehouse and in counter-protest against non-violent black and white civil rights protesters. Birmingham, Alabama: Students wave confederate flags and carry anti-integration signs as they stage demonstration near West End High School, 9/11/63. It is the second day of integrated classes in Birmingham City Schools, 9/11/63. 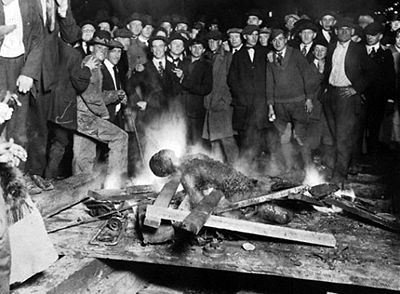 We at Hobbservation Point remind of this history to counter the narrative that America’s tortured racial history is a result of issues from “both sides” because as I often remind, I challenge any reader to produce a picture or postcards of blacks lynching whites, or black politicians discriminating against whites based on race. No one can accept this challenge because it does not exist, and it is important to point out that America has had and still has a problem with angry white males who take the law into their own hands on a whim–while rarely being held accountable for their dastardly deeds by a legal system that was founded by white males for the continuing dominance of white supremacy.